Released at the NAMM Show this year, Fender EFX pedals give you full control over your sound, creating any tone you can imagine. Not mere copies or clones of existing designs, these effects are all-original circuits that were designed by Fender’s in-house team of experts. 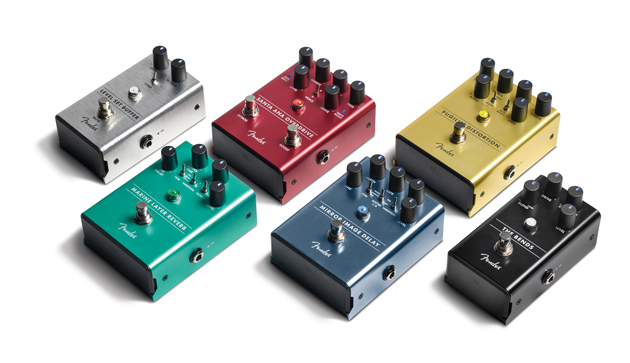 Fender consulted a panel of working musicians while designing these pedals, and the resulting stompboxes are packed with stage-ready features. Crafted from lightweight, durable anodized aluminum, the chassis are engineered for heavy-duty use while the LED-backlit knobs show your control settings at a glance – even on dark stages. The exclusive, patent-pending, magnetically-latched 9V battery door makes it quick and easy to swap batteries and the instantly identifiable LED Fender amp jewel can be easily seen from across the stage, leaving no doubt as to the pedigree of this pedal. Packed with an inspiring palette of tonal colors and stage-ready features, these pedals are unmistakably from the company that defines legendary guitar tone—Fender. Co creator of the pedals Stan Cotey chats to Australian Musician’s Greg Phillips about the pedal range.